This is an Easter card I made for an aunt of mine that hosted Easter Dinner this year. There are 5 children who come to each holiday dinner, so I included the 5 kids on the inside of the card. Card Front: I love that the front of the card gives no hints about what is on the inside of the card. Extra Details: I began this card by creating the water color panel for the front of the card. I used ink smooshing and an acrylic block to create the blocks of color around the frame. I added some interest to the water color piece by flicking some clean water and some of the same inks onto the background. Once the panel was dry, I used two cross stitched rectangle dies to create the frame. I used the same ink colors to water color the tree tops for both the inside and outside of the card. 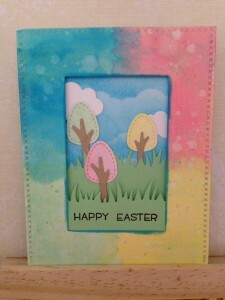 I used the blue ink and a DIY cloud stencil to add the sky area behind the frame to the front of the card base. I layered some grass borders behind the frame. I tucked the trees into the grass. I stamped my sentiment on the front layer of grass. I added a few white die cut clouds to the front of the card also. Once the front of the card was complete, I began to the inside of the card. I lined the top with a blue paper. I used the same DIY cloud stencil and some white pigment ink to create a similar sky scene. The bottom was covered the same green card stock I used for the grass die cuts. I stamped another sentiment on that panel, making sure to leave room for the hand written message. Then I created the Pivot Panel Pop Up. I LOVE this die. It is easy to use and is so unexpected. Using the same green and blue card stocks, I created the panels. I decorated the panels with more water colored trees and some white cloud die cuts. 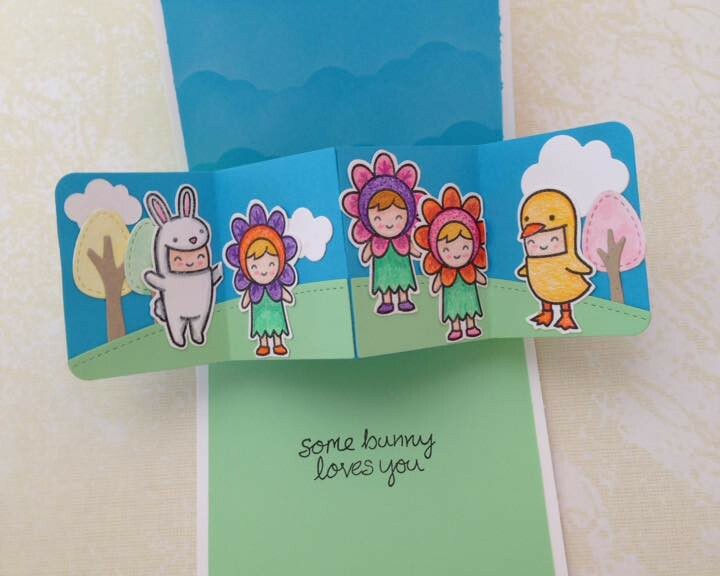 I also added five kids from the Easter Party stamp set. 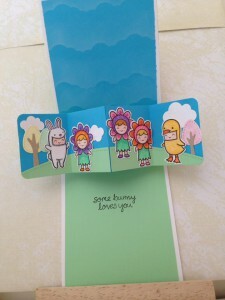 I stamped, colored, and fussy cut those out a few days before constructing this card. I added the Pivot Panel Pop Up to the inside of the card and everything was done. Lawn Fawn’s Yeti White Pigment Ink.